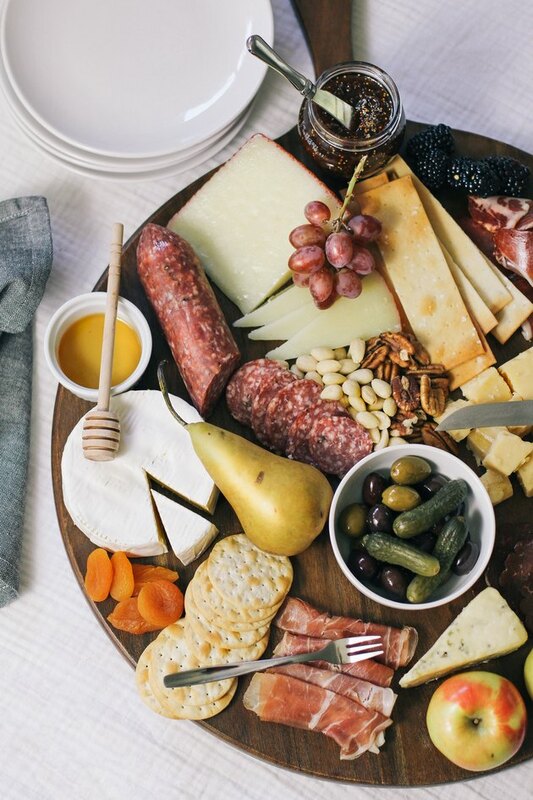 Whether planning a lavish fête or intimate gathering, charcuterie is a host's best friend. Not many party dishes can double as stress-free starter and wow-inducing table fare quite like it can. 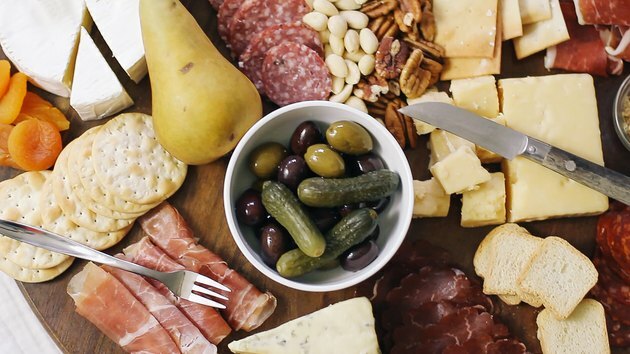 Going beyond the classic cheese plate, "charcuterie" is simply French for "cooked meat" (it's called "salumi" in Italy), and entails an assortment of cured meats that vary in texture and taste, be it coarse or chewy, salty, smoky, or spicy. 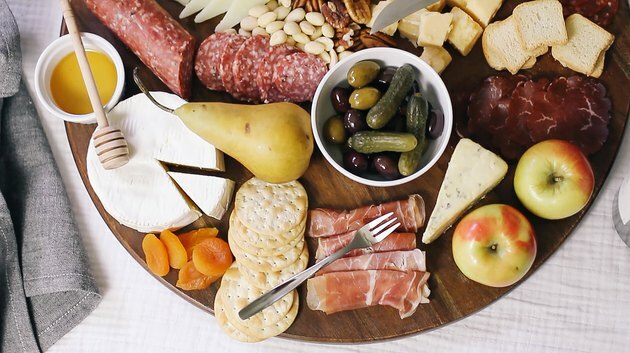 Of course, you need to balance it with a curated selection of sweet and savory accoutrements — artisanal cheese, fruits, olives, and various confitures — to balance the flavors and please the palate. Trust us, maximalism trumps minimalism when it comes to putting together a bountiful and impressive party spread that will keep guests nibbling and mingling all through the night. 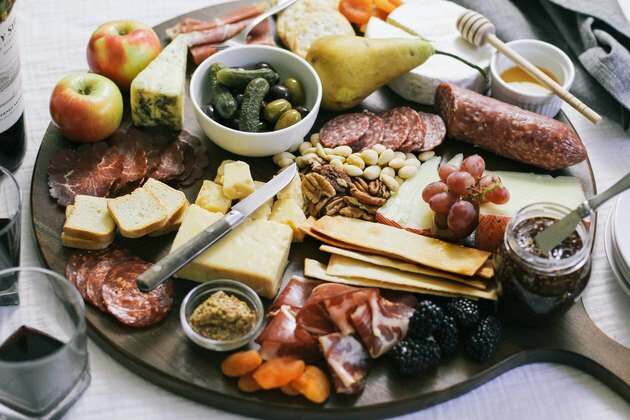 Here, we're sharing our top tips to help you build the ultimate charcuterie board that is simple to put together and will make you look like an ace host. Contrast is key. 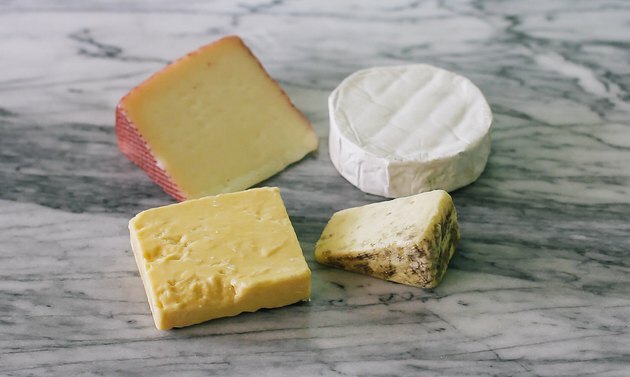 Select a variety of cheeses that vary in texture, flavor, and milk type (cow, sheep, goat, or blend), offering a spectrum that builds from mild to bold. 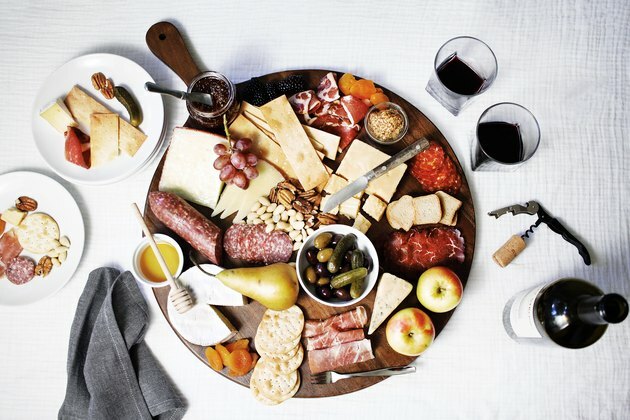 Aim for three to four different cheeses — any more than that can overwhelm the palate. Generally, you can't go wrong by selecting one hard/semi-hard, one soft/fresh, and one blue. Plan on one to two ounces of each cheese per person (double if it is the main course). Keep in mind cheeses have their best flavor when laid out an hour before serving, similar to letting wine breathe before drinking. HARD / SEMI-HARD: We opted for an earthy vintage cheddar (always a crowd-pleaser) and slightly nutty Manchego, but some other examples you might explore are: Comté, Pecorino, Gruyère, Asiago, Parmigiano-Reggiano, Morbier, or Mimolette. SOFT / FRESH: We went with a rich double-créme brie for our board, but definitely give consideration to these other delicious contenders: Camembert, Brillat-Savarin (triple-créme brie), Humboldt Fog, Queso Fresco, mozzarella, goat cheese, feta, or ricotta. BLUE: For its slightly mellow flavor, we chose an American blue cheese called Oregon Blue, but other equally tasty options include: Gorgonzola (Italy), Roquefort (France), Stilton (Britain), Cabrales (Spain), Maytag (US), or Danish Blue. Choose three to five different meats, and again mix up the textures and flavors — regions, too. 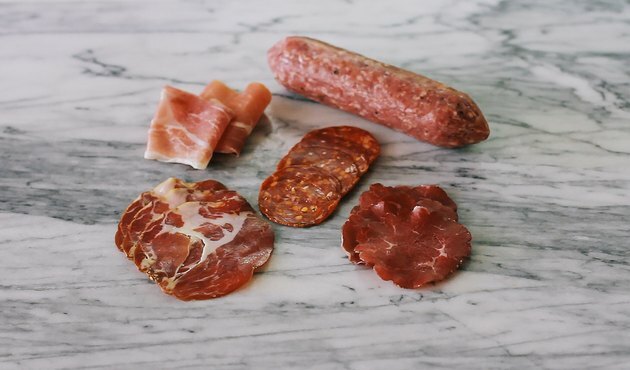 Common cuts like prosciutto and s_alami_ are always a safe bet, but don't be afraid to bring a sense of adventure to the table by offering some lesser known cuts like finocchiona, jamón ibérico, or saucisson sec. For an appetizer portion, two ounces of each meat per person is standard (double if it is the main course). 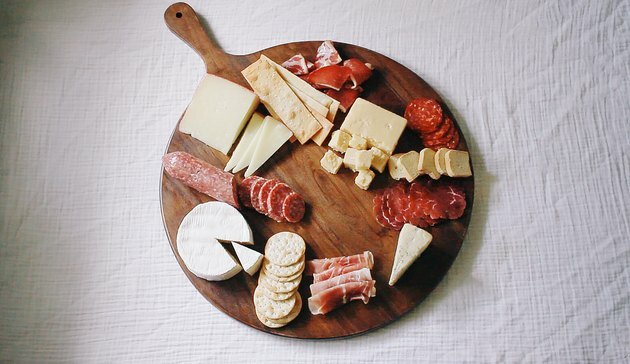 Like cheese, cured meats will offer the best flavor subtleties when served at room temperature. Pro tip: Save yourself the time and have the deli pre-slice the meats for you. SALT-CURED: These include whole-muscle meats that are cured in salt, dried, and typically shaved into paper-thin slices. Prosciutto is the most well-known among them, but others include coppa, lonza, speck, jamón ibérico, jamón serrano, bresaola, and lomo de cerdo. We chose prosciutto and bresaola for our board. ENCASED: These are sausage-style meats that have a casing and are boiled, smoked, or cooked. Salami is the classic choice, but other examples include finocchiona, saucisson sec, capicola, sopressata, chorizo, mortadella, and nduja. Our board features salami, chorizo, and capicola__. PÂTÉ / TERRINE: Pâté is meat that is finely ground often with fat and cooked in some sort of mold. Terrine — such as foie gras — is similar to pâté but is usually made from a chunkier meat and has a coarser texture. Rilletes is also similar in style, but is meat that's cooked and then finely shredded. Presentation is everything. 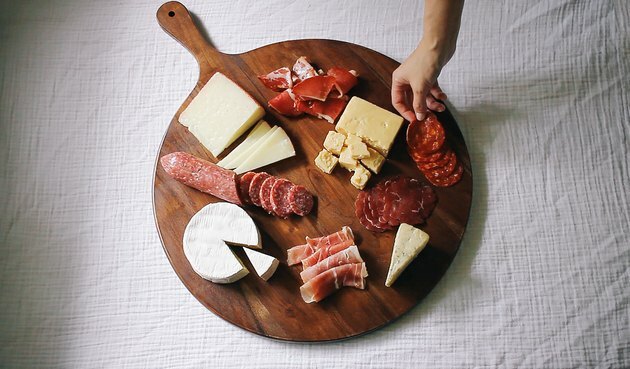 Start with a board large enough to allow you to spread out the various elements of your charcuterie and provide ample elbow room for guests to reach in and help themselves. Lead with the cheese, as it's likely your bulkiest item, but don't just set whole blocks on the board and call the job done. We eat with our eyes first, right? 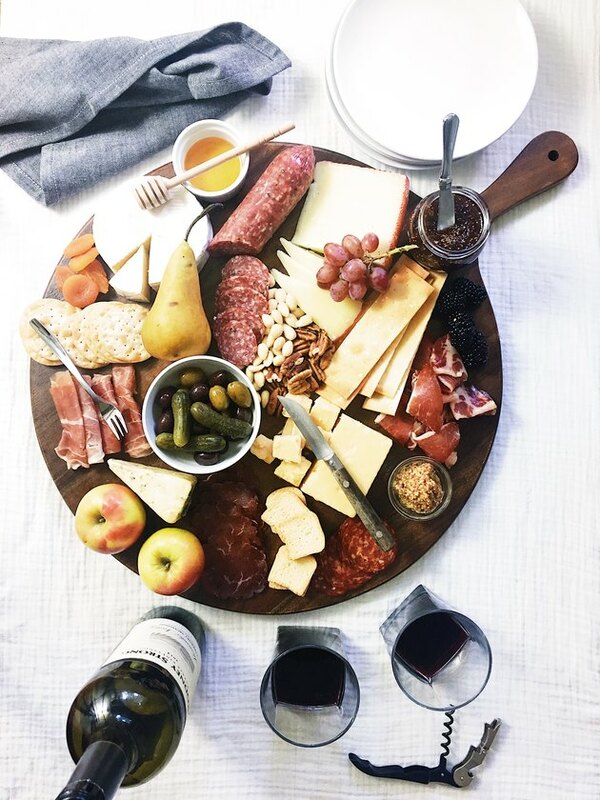 Thoughtfully arrange the different cheeses with artful principles — varying the placement by shape, size, color and texture — and keep the presentation asymmetrical. For harder cheeses, try cutting them either into bite-sized cubes or long slices. Semi-hard cheeses look lovely cut into triangular slices while soft cheeses can be cut into small wedges or rounds. Blue cheese is a great choice to leave whole on the board, or you can pre-slice it following the organic shape of the wedge. Meat goes next and should be arranged with the same principles in mind. Folded, rolled, sliced diagonally, fanned out, or piled high — pick a few different presentation styles to create visual interest and contrast. The goal is for the board to look abundant, nothing too neat and tidy, to encourage guests to dive right in. Though meat and cheese are the stars of the show, the vehicle for building the perfect bite really lies in the carbs. Whether it be bread, crackers, flatbreads, or crostini, be sure to offer a variety of crunchy nibbles for your guests. Be mindful of what flavors and textures will play well with the meats and cheeses. For example, a plain baguette offers a great crusty exterior with a spongy interior to soak up other flavors whereas a sourdough loaf will deliver a tangier bite. When in doubt, opt for a neutral bread or cracker instead of a flavored one so as to not have too many competing flavors. Acidic elements offer a welcome cleanse to the palate from all the salty, rich flavors and are a must-have on your charcuterie board. Olives deliver a wonderful briny bite and are certainly a mainstay. We're partial to the bright green Castelvetrano olives for their buttery taste, or you can certainly opt for a medley of olives to give guests variety — kalamata, picholine, manzanilla, nicoise — the choice is all yours. Whatever you do, don't forget the cornichons — these extra tart pickles pair beautifully with meat and cheese. Lighten up all the heavy flavors with something sweet. Fresh and dried fruit do just that and are also great for adding color and shape to your board. Apples, pears, figs, grapes, cherries, blackberries — these are all classic choices, but do keep the season in mind, as seasonal fruit will be much more flavorful. Dried fruits like apricots, cranberries, raisins, or dates provide a great chewy texture and are available year round. Speaking of dried fruit, nuts go hand-in-hand with it and are excellent for filling in any blank spots on your board. Marcona almonds, pecans, walnuts, pistachios, and macadamia nuts are all tried and true options. Condiments are the finishing touch that round out your board and elevate your charcuterie to ultimate status. Sweet preserves, sour chutneys, spicy mustards — there are soooo many choices. Start with the obvious: Grainy mustard pairs really well with fatty meats. Fig jam makes a lovely pairing with soft earthy cheeses, as does honey. You can't go wrong with any of these staples, and you could stop here. Or you could choose one or two more spreadables that complement the flavors on your board, but don't go overboard. Some ideas: olive tapenade, apple butter, roasted red pepper hummus, onion marmalade, sun-dried tomato pesto, or sour cherry preserves. 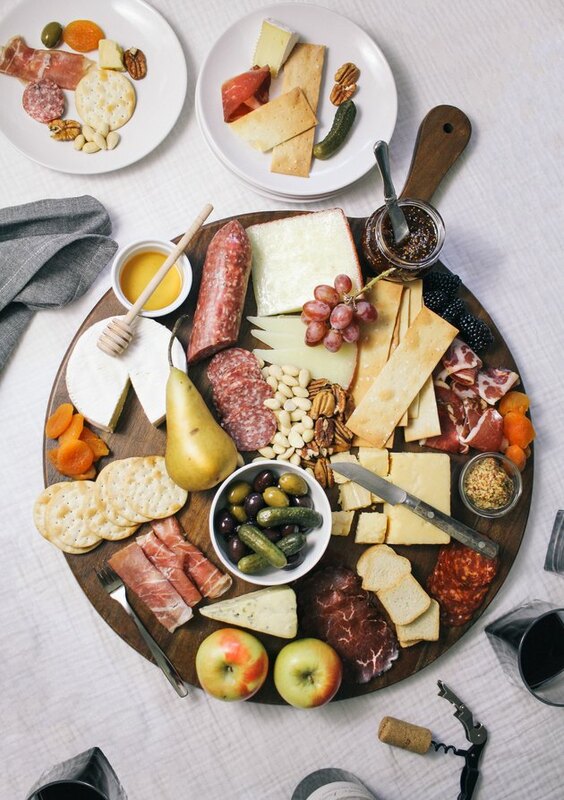 Now that you've put together the perfect board, you'll want to make it easy for guests to help themselves. Give them the right tools for the job. Sharp knives go with hard cheeses, dull knives go with soft, spreadable cheeses or dips, and forks go with meats. Offer a small spoon for each condiment and a drizzler for honey. Each cheese needs its own knife to avoid co-mingling of flavors. 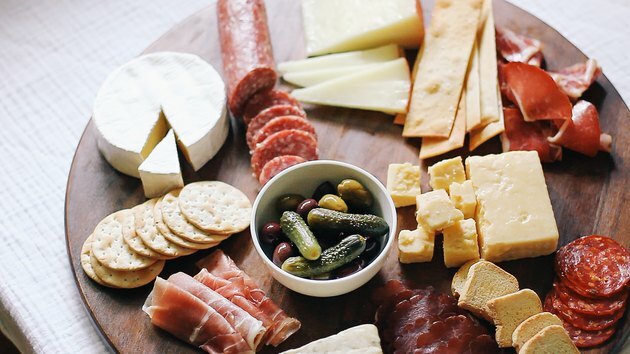 And that, friends, is what we call the ultimate charcuterie board. All that's left to do now is greet your guests and get your party on. What Are the Different Types of Peaches?